Trilok Gurtu and the Arkè String Quartet's "Arkeology"
One of my favorite songs, is a piece entitled "Balatho", written by the brilliant Indian percussionist Trilok Gurtu during his tenure with the jazz group Oregon. (I loved "Balatho" so much, that I even played and recorded it with my own group!) A master tabla player as well as trap set drummer, Gurtu has re-recorded this wonderful song on a new CD with Arkè String Quartet called simply, "Arkeology". This latest version is perhaps the best yet, with Gurtu as the only improvising soloist in the ensemble, (on his famed staccato ragas and vocals as well as a multitude of instruments), and contributed three of the ten compositions. The quartet of Carlo Cantini – Violin, Dilruba, Recorder, Kalimba; Valentino Corvino – Violin; Sandro Di Paolo – Viola; and Stefano Dall’Ora– Doublebass, Ukelele, Emincence Bass/Aptflex, contributed the rest. 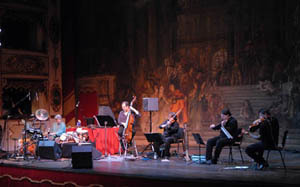 The reviewer John Fordam wrote, "The Arkè String Quartet have shrewdly and musically lent an ear to a lot of world-music materials - from a softly singing microtonal quality reminiscent of Chinese violin music, to the rhythmic devices of Indian classical music and a Shakti-like Indo-jazz fusion, to a Celtic skip, an ambient tone-poetry sigh and much more. Although the samplings from these different cultures don't entirely escape the local equivalents of hot licks, the CD is indeed, varied, sensitively played and affectingly melodic - and Gurtu's famously tumultuous jamming against it is as inventive as ever." Gurtu was born into a highly musical family in Bombay, India where his grandfather was a noted Sitar player and his mother Shobha Gurtu, a classical singing star and constant influence. He began to play practically from infancy at the age of six. Eventually Trilok traveled to Europe, joining up with trumpeter Don Cherry (father of Neneh and Eagle Eye) for two years; touring worldwide with Oregon, the highly respected jazz group and was an important part of the quartet that L. Shankar led with Jan Garbarek and Zakir Hussain. In 1988 Trilok performed with his own group, finally being able to present his compositions on the debut album "Usfret" which many musicians claim as an important influence; young Asian musicians from London like Talvin Singh, Asian Dub Foundation and Nitin Sawhney see him as a mentor and so Trilok's work finds its way onto the turntables at dance clubs years later. But back in 1988 Trilok met The Mahavishnu Orchestra and its leader, John McLaughlin and for the next four years played an integral part in The John McLaughlin Trio. In 1993 Trilok toured his own trio in support of the album "The Crazy Saints", which featured not only Joe Zawinul but also Pat Metheny. Audiences were enthralled by his compositions that linked subtle Indian rhythms and Indian singing with elements of modern jazz and rock. The following year the band was expanded to a quartet and touring extended to include a US coast-to-coast tour and 40+ European shows. Band tours continued annually establishing Trilok Gurtu as a regular and popular visitor to many European and US cities; his group, The Glimpse was formed in 1996 which grew from his musical roots in India's timeless acoustic tradition. By the late 90's they were touring worldwide and appearing in Festivals where he performed alongside the megastars of the entertainment business (Bob Dylan, Eric Clapton, REM) as well as his colleagues in the World Music scene like Youssou N'Dour, Baaba Maal, Cesaria Evora and Salif Keita. The "Kathak", "African Fantasy" and "Beat of Love" cds came about in 1998/9, 2000/1 as a direct result of these years: Trilok's music entered a distinctly World Music setting. These Indian/African cds were snapped up, with public and media alike enthralled by Trilok's heady World mixture; a new sound that contained the core of his previous works but expanded on it allowing guest singers like Neneh Cherry, Salif Keita, Angelique Kidjo and Oumou Sangare to display their talents in Trilok's unique world. When Trilok hit the live performance circuit in 2000 and 2001 with his new group of 3 Indians and 2 Africans, sales of cds zoomed way over those of previous recordings. Audiences saw the group with special guest appearances by Nitin Sawhney, Angelique Kidjo, Salif Keita and "The Beat Of Love" producer Wally Badarou in New York and London. In between a hectic schedule of group performances he has appeared at a number of prestigious solo percussion recitals and given guest performances on albums by John McLaughlin, Pharoah Sanders, Nitin Sawhney, Lalo Schifrin, Gilberto Gil, Bill Laswell & Annie Lennox. The release of "Remembrance" in 2002 was a major milestone for Trilok. The guests Shankar Mahadevan, Zakir Hussain, Ronu Majumdar and Shobha Gurtu gave superb performances. Reviews in London were all 4**** and better, including The Times, Daily Express, The Guardian, Q, Songlines and FRoots. Combined with extensive touring across Europe and especially Scandinavia, this led to Trilok's second nomination for the BBC World Music Awards and for an EMMA. Stand out performances were at London's Hyde Park for the Queen's 50th Anniversary and in Bombay as part of a global satellite-delivered concert with Youssou N'Dour and Baaba Maal celebrating the BBC's 70th Anniversary of their World Service. 2003 saw a wide variety of over 50 performances all over the globe from Trilok Gurtu in quartet, trio and solo formats. His first collaboration in an orchestral piece took place in Koln in October, with the World Premiere of "Chalan" written especially for him by Maurizio Sotelo. Other key 2003 performances were at Cité de la Musique, Paris in April with special guest Shankar Mahadevan; in Utrecht with Robert Miles, Kudsi Erguner and Hassan Harkmoun and in Sardinia with Dave Holland. The most spectacular was certainly in Copenhagen at "The Images of Asia Festival" where he orchestrated a joint performance of his own band with Samul Nori (Korean Percussionist) and Huun Huur Tu (Mongolian Throat Singers). All this on a floating stage in Copenhagen Harbour at sunset - quite delicious! Exotic cities like Belgrade, Istanbul, Tbilisi and Kathmandu got another chance to enjoy his work and MTV took another clip in Bombay. Trilok started 2004 with a 10-date tour of Norway in February followed by an extensive tour of 25 concerts in France to announce the release of his eleventh cd "Broken Rhythms". "Broken Rhythms" followed the critical success of "Remembrance", a second album mainly recorded in his home town of Bombay, with a strong selection of Indian singers and musicians. As with all Trilok records, the accent is on rhythm and drumming - but this one more so. Featured collaborations with the Tuvan Throat Singers Huun Huur Tu, the Arké String Quartet and an outstanding screaming guitar part from Gary Moore bring a heady mix of bright and fast with gentle and peaceful. The album was released in France in March 2004 and received 4 star reviews. Two visits to the USA with his group included the huge Stern Grove Festival in San Francisco in front of 20,000 spectators; Italian, Montenegran and Serbian engagements with further French dates in the Autumn completed his year. "Arkeology" is the union of two seemingly different worlds: Gurtu’s extraordinary rhythmic vitality and versatility and the classic string quartet’s sound reinterpreted by Arkè String Quartet. Here two multimillenial musical traditions merge, melting in melodies, polyrhythms and new counterpoints. Their project is based on a fascinating linguistic research, which has the sole aim of allowing the pure force of the singing and the rhythm to emerge, these being the expressive cores of the Indian and Mediterranean musical traditions. I loved it, and I think you will too.